I love Penny Black stamps---this one is called Asking the Flowers. This fella is just too cute. I paired this stamp with JustRite Tiny Words & Centers sentiment. Instead of creating a standard card...I decided that it would be cute to create a mini card mounted on a base. So the hedgie part flips up so you can read the inside message. and some fun May Arts ribbon. The designer paper is from Kaiser Craft called Everblooming. You can find all the supplies for this card at Stamper's Dream! And some other fun news---Stamper's Dream now carries Tombow markers. Woohoo! I LOVE trying all types of coloring mediums, so I had to get a few to try them out! I will be posting with them soon!!!! What an adoreable idea! 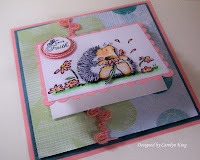 I adore your coloring but that little note card within the card base is sensational! What an adorable card! That hedgehog is very cute! I wish I had unlimited resources so I could check out all the stamps like Penny Black and Just Rite. So many things to stamp and so little time! LOL. Hope you have a wonderful day! Cute, cute, SUPER cute! 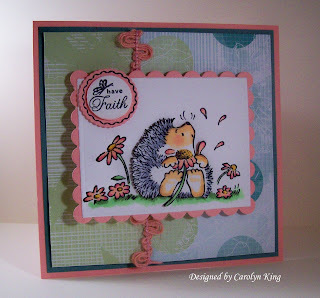 Love the hedgie and your idea of a card on a card! How clever is that!!! Great card, my friend! I have thought about mounting a small car shaped card on CS like this. Now I know I will. It looks so good Thanks for the inspiration. Oh this is adorable! Love your design! This is absolutely ADORABLE!!! I love those little hedgies as well! So cute! Love the way it opens! I never think to do that! So Adorable & I just love your card design! I might just try this one! Who couldn't love such a cute image?!! Absolutely darling Cam!! Love your sweet image paired with the *Faith* sentiment!! Can't wait to see what you do with the Tombows either!! Love how you colored that sweet hedgie. Great layout, I love it!! Very cute! Lov eyour idea with a mini-card! What a great idea! I love it! Love the entire card too! I really like the trim and image! This is just so very adorable!! Love that ribbon too!! So adorable!I've nominated you for a blog award!